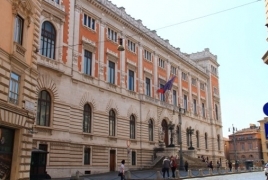 PanARMENIAN.Net - The Regional Council of Lazio, Italy on Monday, March 18 unanimously approved a motion acknowledging the historical validity of the Armenian Genocide, the website of the Armenian community in Rome reveals. Introduced by Councilor Sergio Pirozzi, the bill expresses solidarity with the Armenian people in their battle for historical truth and the protection of human rights. With the approval of the motion, the Lazio Council becomes the 136th council in Italy that recognizes the Armenian Genocide. “The motion is a sincere demonstration of solidarity with a nation that fell victim to deportations and brutal killings, in the hope of warning young people and future generations,” said Pirozzi in an emailed statement to the Armenian community. Armenians throughout the world commemorate the Genocide on April 24 because on that date in 1915 a group of Armenian intellectuals was rounded up and assassinated in Constantinople by the Ottoman government. On April 24, Armenians worldwide will be commemorating the 104th anniversary of the Genocide which continued until 1923. Some three dozen countries, hundreds of local government bodies and international organizations have so far recognized the killings of 1.5 million Armenians as Genocide. Turkey denies to this day.